Lesson day! Both my trusty photographer and videographer were unavailable this morning, one of them is sunning herself somewhere hot! Therefore you’ll have to do with a dodgy selfie and Raven’s first attempt at a photobomb! Today we discussed how Saf’s default setting is a rather immobile jaw, poll and neck. This has a knock on effect down her body, giving a general stiff, stilted feel in the walk. 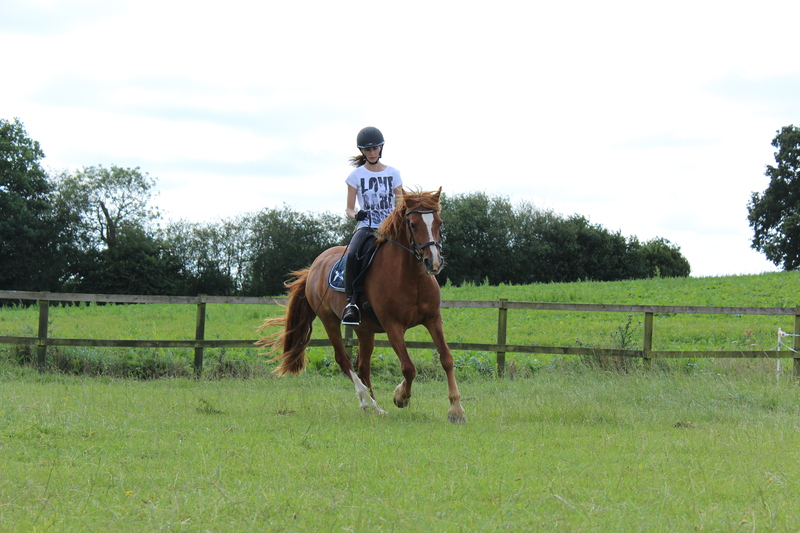 I now need to do something about her stiffness and not be afraid to pick up my reins. As with everything riding, it’s a matter of co-ordination and timing. I need to use my outside rein to check her neck is straight, then my inside rein with an ‘opening’ feel to ask her to mobilise her jaw. Another fascinating lesson, thanks Max. Can’t wait to get schooling next week and get working on this. 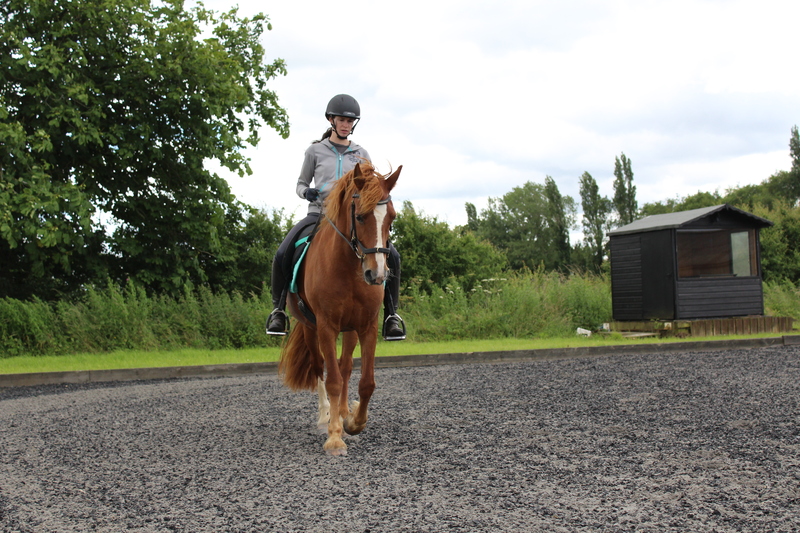 This entry was posted in lesson, Training / Schooling and tagged biomechanics, classical, dressage, equestrian, fixed jaw, fixed poll, lesson, mobile jaw, mouthing the bit, riding, riding position, saffron, welsh cob on September 17, 2016 by Emma. Lesson – Relax those hips! Scorchio lesson on Saturday morning. Spent today working on keeping my upper legs and hips loose and ‘off’. I need to allow Saf room to lift her back and she can’t do this if I’m squeezing her! I think I got a good feel for this so will try be aware of what’s going on there. 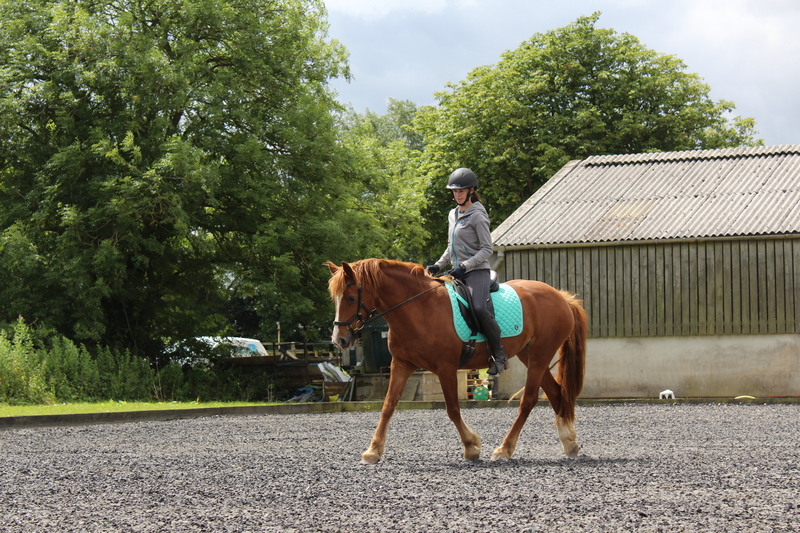 We did a bit of work in canter as well, which felt lovely, I’m really learning to love Saf’s canter, which I never thought I’d do. Concentrating on keeping my hips and thighs relaxed is particularly important at this point, especially given that I tend to squeeze her if I feel she’s slowing down as mentioned in yesterday’s post. I need to just ask Saf to do something, and then let her do the work. I’m too much of a ‘doer’ and end up doing more work than her and stifling her. 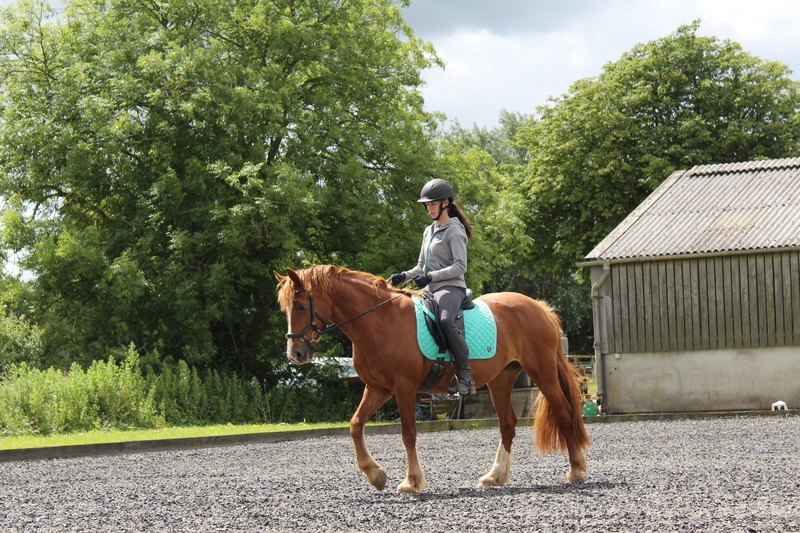 This entry was posted in lesson, Rider position and tagged biomechanics, classical, classical dressage, dressage, equestrian, horse, lesson, natural horse, photos, riding, riding position, saffron, schooling, training, welsh cob on July 18, 2016 by Emma. Wandered over to Bluegate on Saturday (well, an hour’s wander!) to hire their gorgeous arena. It really is a treat to have a go on it, but the main reason for our visit was to get some nice, relaxed work from Saf away from her home environment. We’ve not been here since September last year but Saf felt at home at once. A little tense at first, but got down to work pretty quickly. Had a quick walk, trot and canter to warm up, concentrating on keeping Saf focused on me. It’s a very quiet place, but Saf used the horses being brought in as an excuse to have a gawp. Once the tension settled, I felt I could get my leg on her a little more, without the feeling that she would wizz off. Got some lovely work towards the end where we had both lateral and topline flexion, but Saf would respond with the third evasion, namely speed. She insists that she can bend correctly and flex her neck at the same time, but she has to slow down, so I then have to ask for forwardness, which she responds to but shortens her topline, and so it goes on! The thing is, we could do all this and really knuckle down and got the same kind of work we get at home, so absolutely over the moon with her today! 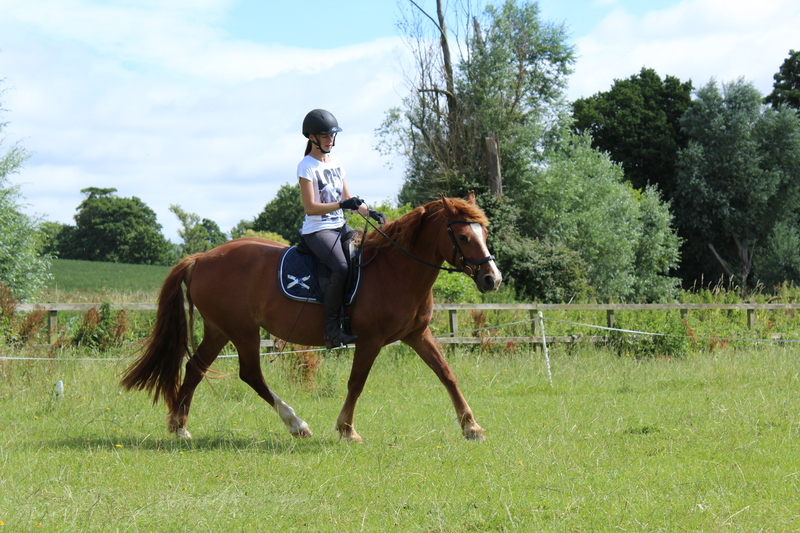 This entry was posted in Rider position, Training / Schooling and tagged bending, circles, classical, contact, dressage, equestrian, horse, photos, riding, riding position, saffron, schooling, training, welsh cob on July 3, 2016 by Emma. First competition at Codham Park on Saturday. Approx 1 hour 20 minute hack, which involved wading through a flood! This was our first time at Codham, and Saf was Tense with a capital T. We arrived an hour before my time, gave Saf a break after her hack, got changed and on to the warm up. Saf’s eyes were on stalks and the warm up was rather busier than we’ve encountered at Bluegate. There were more lorries, horses and people milling about in general but there was a nice atmosphere and it didn’t feel busy, if you know what I mean. I couldn’t really get any sense out of Saf in the warm up, she just refused to listen and I ran out of ideas after a while. Eventually I managed to gain some of her attention but wasn’t too hopeful as I was called. You can see from the pix that she was just a ball of tension the whole time. I know it’s a new venue and we’ve not been out since September last year but it was really hard work and I felt like I’d been down the gym by the end of the test. She just kind of fixed her neck and I couldn’t get her to move it. In hindsight I probably should have tried letting her go a bit more but I’m convinced she’d have just shot off at 100mph! Never mind, it was a lovely place and we’ll definitely be back next time. Good points: Well I remembered the test, and she basically did everything she was asked (albeit fast!) and our halt was good. 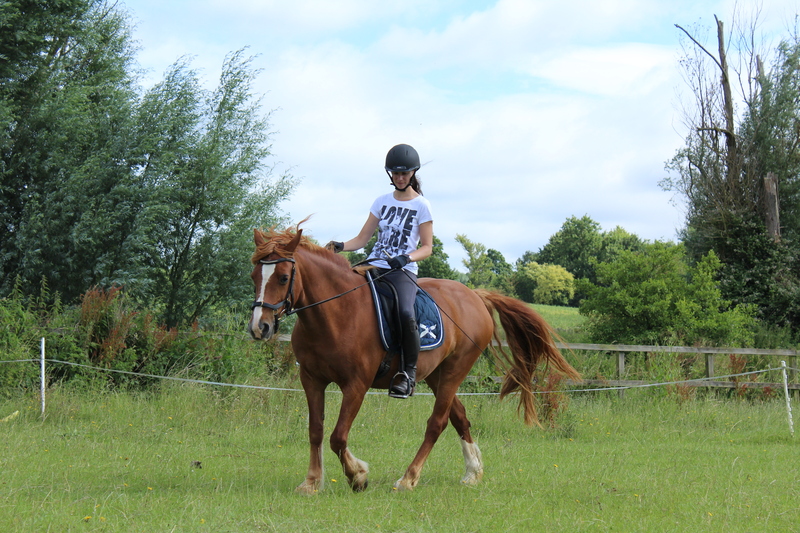 This entry was posted in Competitions, Uncategorized and tagged classical, dressage, equestrian, horse, riding, unaff, unaffiliated, welsh cob on June 20, 2016 by Emma. Another great lesson last weekend! Worked on a few different things, starting with getting my legs more under by centre of gravity. I still have the annoying chair seat which keeps cropping up, so more revision required. You can see how it’s supposed to look in the first photo. I also had a ‘thing’ where my foot and hand on the same side, seem to get attracted to each other, so concentrating on trying to push them apart. This sorted, I got some much needed help with my rising trot. We’ve done a lot of work sitting, but I have been frustrated by my rising trot for a while. I always had the feeling that my rise was wrong, and when I sat I was unbalanced and behind. As such, I felt like I was constantly fighting to keep up with Saf. Max had me keeping my heels further back, rising from my knees and coming further forward over the pommel. This helped tremendously and I’ve never felt a rising trot like it. 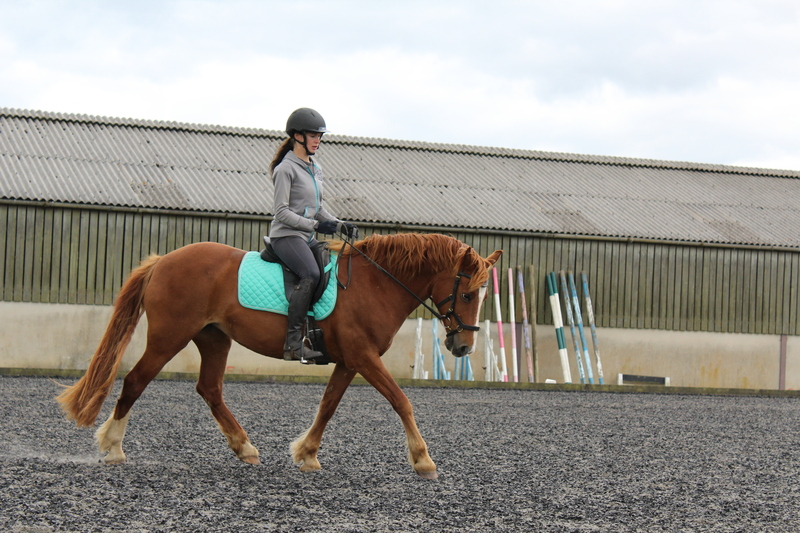 This entry was posted in lesson, Rider position, Training / Schooling and tagged biomechanics, canter, circles, classical, dressage, equestrian, horse, lesson, riding, riding position, rising trot, saffron, schooling, training, trot, welsh cob on June 10, 2016 by Emma.